I Love to Skate -10yr- A Really Fun Birthday! 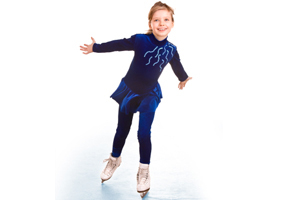 For my 10th birthday I did a Ice Skating party because I loved to ice skate. INVITES: Since my mom is a card maker she just made up a little cute card that had a little person ice skating on it and she wrote Your Invited" and in the inside she wrote all the party details. But if your mom is not a card maker you could cut out a shape of an ice skate and write everything on it and mail it in a blue envelope because blue reminds you of the cold. Also we told them to bring a coat and gloves. Decorations: We did a smiley theme for the party room. All the plates had smiley faces and so did the balloons, cake and napkins. Also the gift bags were blue with smiley faces on them. Activities: Ice Skating of course. Games: We did not do any games. We just skated around and had fun. Party Snacks: We did Pizza from Domino's and we did cake from our local cake store. Favors: We did blue gift bags with smiley faces on the outside. Then on the inside we gave each kid a pencil, gum, stickers, a bouncy ball, and hair ribbon. THE PARTY: All my friends arrived at the ice rink around 1:30. When they were all there we did pizza and talked. Then after pizza we went right on to the cake and after that we did presents. After that we all got our skates on and we got on our coats and went to skate. We skated for about a hour then took a little break. After the break we went back out and skated until the rink was going to close. Then we all got our skates off and took off our coats and went back into the party room. I handed out the goodie bags and we all took the time to look in ours. After that the parents started to come and pick up their kids. It was a really fun birthday party.